Threatened by water scarcity due to severe drought, Reserva Conchal turned to Fluence for a sustainable, reliable, and cost-effective seawater desalination solution: Three Nirobox units with a total capacity of approximately 1,500 m3/d of water. Due to an ongoing local drought, Reserva Conchal – a beach resort, golf course, and spa in Costa Rica – was facing water scarcity for several years, with more years of drought expected in the future. This case study shows how Fluence introduced Costa Rica to containerized desalination, the best available option for Reserva Conchal in this extreme situation. Reserva Conchal is located on Playa Conchal in Cabo Velas, a popular tourist destination about 45 minutes by car from the Liberia International Airport. The property, which is considered one of Costa Rica’s most luxurious resorts, includes a Robert Trent Jones II championship golf course and an all-inclusive five-star hotel, as well as a residential real estate development. Next to the property a piece of land is set aside as a wildlife refuge, which is home to approximately 32 species of birds, 12 species of mammals, various reptiles and amphibians, as well as a wide range of local plant life. The reserve, which covers almost 100 acres, is extremely popular with Reserva Conchal guests and homeowners. To secure a reliable source of drinking water and reduce reliance on stressed aquifers, in 2016, Reserva Conchal contacted Fluence to install a desalination plant. Since late 2014, Guanacaste, Costa Rica’s second largest province, has experienced one of the worst droughts in its recorded history. With the drought, aquifer recharging has diminished, increasing the salinity of what little groundwater remains in coastal aquifers. Additionally, there is no water infrastructure to transport water over long distances. Guanacaste’s primary industry is tourism, and a lack of water could harm it. Nationally, the industry generated roughly $2.8 billion in revenue and employed 600,000 people both directly and indirectly in 2015, according to The Tico Times. That year, a record number of visitors from around the world — 2.66 million — visited the Central American country. According to Bank of Costa Rica data, tourism revenue is expected to reach $3.1 billion in 2017. Coupled with increased demand from residents, water scarcity is a real problem, with potential repercussions throughout the economy. Reserva Conchal needed a solution that would not affect the environment. Not only was a sustainable supply of high-quality, potable water needed, but the technology had to be housed in a way to prevent jarring noise from spoiling the natural setting. Above all, time was an urgent consideration. Fluence’s Nirobox provided Reserva Conchal with an attractive option. 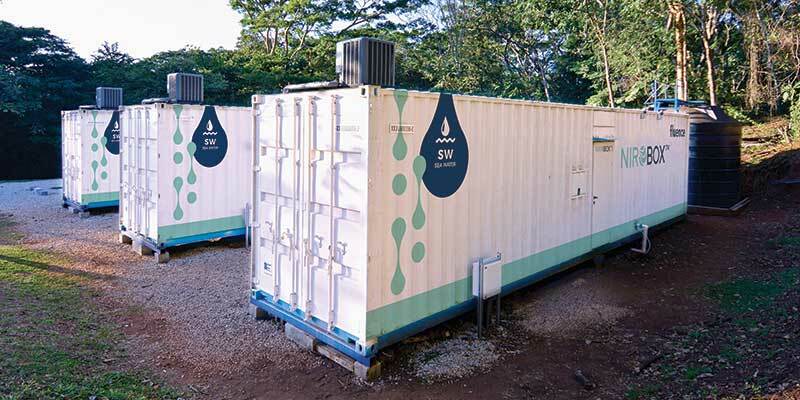 The containerized system could provide all the benefits of desalination without requiring a huge footprint or extensive infrastructure investment. It could easily blend in with the surroundings without damaging the landscape. And its plug-and-play design meant it could be up and running in very little time. Although this was the first seawater desalination facility in Costa Rica, Reserva Conchal was confident in Fluence’s ability to select the appropriate technologies due to its extensive experience with both containerized and custom-designed desalination. The client needed a solution with a high recovery rate that featured low energy consumption and required minimal use of chemicals. The system had to be quiet, have a small physical footprint, and a low ecological impact. A “smart” intake and discharge capability was needed to minimize impacts associated with intake suction and to diffuse the brine as much as possible. The installation of three Nirobox units was designed to have a total capacity of approximately 1,500 m3/d of drinking water. The system was started up only eight months after it was ordered, with a plan to gradually increase reliance on the system with the approach of tourist season. With desalinated water readily available, the resort will be able to operate at full occupancy even in the dry season, irrigating golf courses, supplying water for swimming pools, and providing service water throughout the development. Fluence was able to help Reserva Conchal quickly secure a reliable, cost-effective, and energy-efficient source of water without disturbing the local environment.